Three races comprise the Triple Crown of horse racing: the Kentucky Derby on the first Saturday in May at Churchill Downs in Louisville, followed two weeks later by the Preakness Stakes at Pimlico in Baltimore, and winding up three weeks after that with the Belmont Stakes in Long Island. And, of more interest to this website, each of these races are traditionally associated with a drink for the spectators. What better way to turn the Sport of Kings into Entertainment for Drunks than to test all of them? No thoroughbred has won the Triple Crown since Affirmed in 1978, but hopefully you can pick a winner among these six drinks. Interestingly enough, Early Times is marketed as a "Kentucky whisky." (No, I'm not sure why they use the Scottish/Canadian/Japanese spelling, and not the more common-in-America "whiskey.") It can't be legally called a "bourbon", as it's aged in used oak barrels and not new. Black-Eyed Susans. From left: the current version, the Snoball Susan, the original. Tomorrow, they run the Preakness Stakes at Pimlico in Baltimore. In the infield, "Kegasus" will be exhorting the revelers to drink beer, but the official drink in the grandstand is the Black-Eyed Susan, named for the state flower of Maryland. (Just as the winning horse in the Kentucky Derby is presented with a blanket of roses, the Preakness winner is draped with a blanket of black-eyed Susans...or would be, if black-eyed Susans actually bloomed in May, which they don't. Instead, they make a blanket of Viking daisies, and paint their centers with black lacquer to mimic the appearance of a black-eyed Susan. Sigh.) 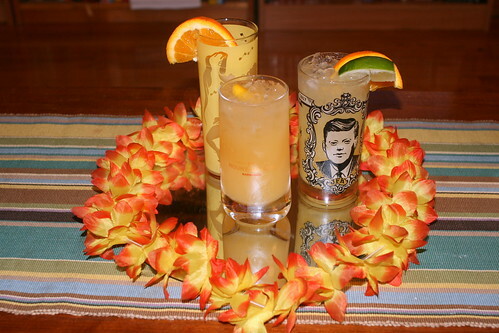 But there's a wrinkle: the recipe for the "Black-Eyed Susan" has changed over the years. Build in a Collins glass filled with crushed ice. Add a Maraschino cherry, an orange wheel, a pineapple cube, and a lime wedge for garnishes. Note: it's imperative to squeeze the juice from the lime wedge into the drink. The Baltimore Sun has investigated the shifting history of the drink, and notes that a recipe sounding very similar to the above appeared in a Junior League of Baltimore cookbook in 1985, and adds that "later versions called for a shot of peach schnapps. Pineapple juice came and went as a favored mixer. Grapefruit juice had a short run. Orange juice has been a constant, but some recipes call for [a] sizeable dose, and others suggest a simple 'splash.'" Garnish with orange slice, cherry, and stirrer. Five miles away from the Pimlico racetrack sits the Grand Cru wine bar, highlighted by the Sun's Rob Kasper as presenting an interesting variation on the Black-Eyed Susan. Grand Cru proprietor Nelson Carey and bartender Chris Attenborough make a boozy version with Pikesville rye (originally made in Maryland, but now distilled in Kentucky) replacing the Early Times. Combine ingredients in a mixing glass, and pour into a highball glass filled with crushed ice. Garnish with a "flower" made with three strips of lemon zest attached to a toothpick with a dark cherry in the center. This was an interesting taste-test. Tony and I were joined by Joanna Scutts, who writes the (excellent; go check it out) food blog life.savour. I made the three Black-Eyed Susans, and we passed them around. The universal consensus was that we vastly preferred the variation over either of the two official versions; the complex, potent Snoball Susan had more character. Tony noted that "you can feel the punch", adding that "you could drink these all afternoon...and wind up under a house." I'm not sure I could have these all day -- successive sips only tasted stronger and more emphatic with the alcohol burn. Tony and Jo both preferred the older, original Black-Eyed Susan to the current version, and singled out the more tropical, fruity tastes, chiefly coming from the pineapple. Jo said it tasted a little bitter, which I think may have been due to squeezing the lime wedge into the drink. I didn't like this one very much, and liked it less and less as the tasting progressed -- there was something about the interplay of lime and pineapple that I really didn't care for. I liked the current Black-Eyed Susan better, disagreeing with Tony and Jo -- Tony found it "nondescript", and Jo allowed that it depended greatly on the quality of the juices, surmising that it's probably served at Pimlico with bottled OJ but that it would be improved with fresh-squeezed. (And I refuse to touch sour mix, so I made my own -- much better -- approximation with lemon juice and rich simple syrup.) Jo called it basically "a sweeter and more pleasant screwdriver", while Tony called it "a stealth drink" that hid its alcohol well. None of us could taste the whisky in this one. If I were sitting in the Pimlico grandstand on a hot May day, this would be the one I'd want. Belmont Breezes. From left: original version, current version. Shake all ingredients and strain into a chilled cocktail glass and garnish with an orange wheel and mint sprig. Shake vigorously with ice and serve in a rocks glass with ice. Garnish with red cherry or lemon twist. We tasted the current version first, and I thought it was a little watery -- the flavors were nice, but the bourbon got lost, and there was no bite at all. We all agreed that the lemonade was the culprit (I'd made lemonade in the shaker with lemon juice, simple syrup and water; I assume they use premade lemonade at Belmont Park), and wondered if a homemade sour mix of fresh-squeezed lemon juice and simple syrup, omitting the water, would sharpen the flavors and give the bourbon some zing. However, the older Belmont Breeze recipe blew us all away, surprising us with its complexity and depth of flavors. We loved it. (Julie Powell disagreed in 2005, sniffing at it in the Times and saying it tasted "like a refined trashcan punch." Perhaps the recipe as served at the park at the time was different?) 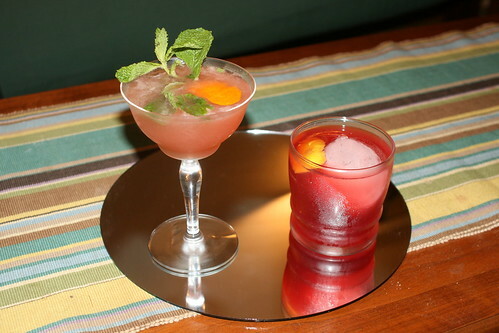 The sherry's dryness gave the drink some structure, and the mint really added to the overall effect. This was an exceptionally good cocktail, one that we agreed would make for good drinking anytime. I think this one'll be in the repertoire this summer. Overall thoughts about the entire Triple Crown of cocktails? We agreed that the mint julep is an absolute classic, and Tony joined in, saying "you're not going to go wrong with a julep." Jo said that if she was going with something a little more exciting, she'd pick the Belmont Breeze (old version.) 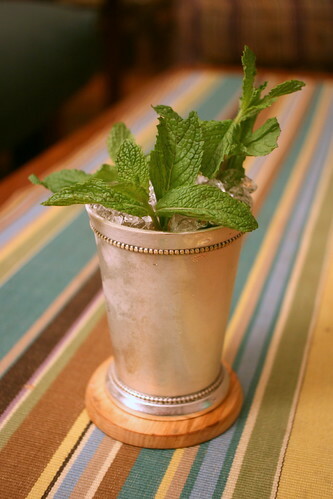 I opined that a julep is perfectly exciting...but I do see her point, as there's more flavor interplay and different tastes in the Belmont Breeze. If we're limited to the versions as currently served at the racetracks? Jo likes the Belmont Breeze, pointing out that the pomegranate juice makes the drink drier and more sour. I'm inclined to agree, but Tony went the other way, saying "I'd rather have a second-rate julep than a new Belmont Breeze." How about our favorite drink for watching a horse race? Jo and I unquestioningly went for the old version of the Belmont Breeze. Tony agreed in principle, stating that "if I'm gonna have one drink while watching a two-minute race on TV, it's definitely the old Belmont Breeze. But if I'm gonna have five, drinking all day outside at a track and standing in the sun, then I'm going to go with the julep." This is a really well done piece. I enjoyed it and, like any good cocktail piece, made me wonder how I might update these recipes. My favorite here is the updated Belmont Breeze. I love Woodford Reserve and think it makes a great cocktail. Thanks for sharing this one. took the Oak Alley tour. Purchased the same julep also.I took one sip,switched hands and pump faked it over my shoulder into the hedges.Cool place,crappy drink.The $$ go toward upkeep of the plantation = completely worth it.